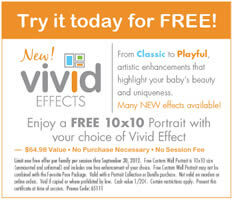 Bring this coupon to your local Kiddie Kandids to score a free 10x10 Vivid Effect Portrait! This is a $64.98 value! No purchase necessary and no session fee. Expires Sept. 30th, 2012.